Brian's 24 - San Diego Dining Dish! The Gaslamp District of San Diego is just teeming with restaurants and bars. After all, anywhere with a nightlife (and day life) of the Gaslamp must have a bevy of restaurants serving any type of cuisine desired, from pub grub to South Indian. Added to this list of cuisines is great American diner food. Now, diner food doesn't usually evoke sighs of grandeur or the exotic, but instead, heavenly sighs of the familiar and comforting. I'm talking about platters of roasted chicken piled high with homemade mashed potatoes and gravy, club sandwiches with bacon spilling from the edges, and delicious eggs made to order, any style. 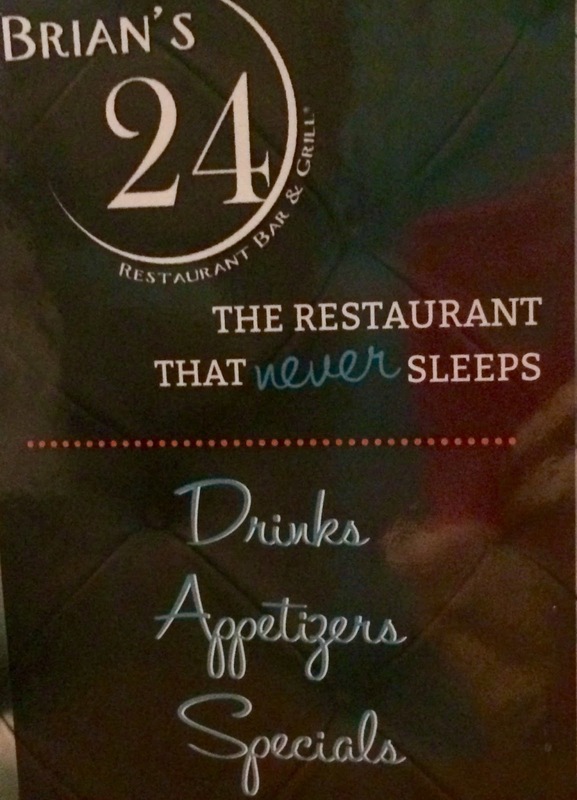 Brian's 24 is the only 24-hour, every day restaurant in the Gaslamp District. A family-run diner, Brian's has an extensive menu of American favorites, as well as some San Diego favorites, such as breakfast burritos! When you go in, however, you will first be stunned by the beautiful decor. Seriously, this is one of the prettiest dining rooms that I've ever seen. It was reminiscent of Chartier in Montmatre (which I love) with all of the mirrors and the gorgeous chandelier! As stated before, the menu is quite large, as they usually are for diners, but everything looks good! There are no pictures on the menu, which I take as a good sign. When diners put pictures on their menu, I know that generally, the food is going to be mediocre. 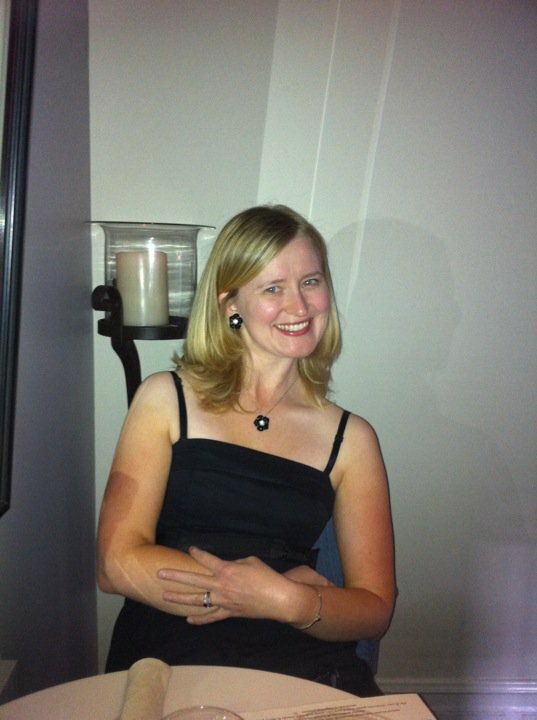 After a lot of considering (burgers! fried chicken and waffles! omelets! ), we chose the mozzarella sticks to start. I haven't had them for ages, and there's nothing that tastes better than hot, stringy cheese dipped into homemade marinara. Since Brian's 24 has a full bar, so if the mood strikes, patrons can enjoy an adult beverage with dinner. 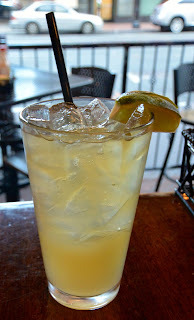 We decided to try the Dark N' Stormy, one of my husband's favorite drinks. Dark rum, ginger beer, and lime is such a refreshing combination, and this one was well made and delicious. For dinner, sandwiches were the thing to eat! My husband loves Monte Cristo sandwiches, but only has them occasionally, because, well, they're really bad for you. A sandwich that combines breakfast and lunch, the Monte Cristo is two pieces of French toast housing turkey, ham, and swiss cheese, then sprinkled with powdered sugar. Brian's served their Monte Cristo with a side of maple syrup for dipping! The sandwich had the perfect amount of fresh meat, and the contrast of sweet and savory makes it downright addictive. I was in the mood for the diner classic, a turkey club, and when I saw that Brian's serves the club on Texas toast, I was sold! Texas toast gets me every time. There's something about those thick slices slathered in butter and toasted that just makes me weak in the knees. This club was magnificent, with loads of turkey and bacon, and a layer of Swiss cheese to bring things together. Brian's offers sweet potato fries as an alternative to regular fries, which were tasty (and loved by my daughter). After those huge sandwiches, of course we had dessert! A pecan blondie piled with vanilla ice cream, whipped cream, and a drizzle of caramel. This dessert was something different, but still had that homey, comforting warmth and flavor that is so essential to a dessert. Dessert makes you feel better. It's what we eat when we're upset or celebrating, so it should have a comforting quality. This dessert has just that. 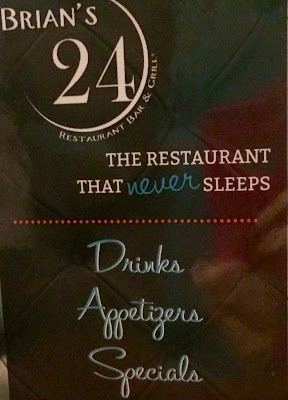 Brian's 24 is VERY family-friendly, with a menu of things that will please even the pickiest of appetites. If my daughter is excited for the food, anyone will be! The restaurant, while being very easy for kids, still has a very hip, grown-up feel. There is a full bar, so mom and dad can have a cocktail with dinner in a relaxed setting. Definitely a winner in my book.